I shot my last assignment of the year earlier today. I will spend New Year’s Eve working the on the photo desk (which is better than spending it photographing a bunch of drunks). I was assigned to photograph Mackenzie Saunders getting physical therapy at St. Joseph’s Hospital in Phoenix. The preteen was hospitalized on Dec. 19. What landed her in the hospital has to be the worst nightmare of every parent of teenager or student athlete. She was playing a youth soccer game in Ahwatukee, a suburb of Phoenix, and took a hit from one of her opponents. It was a hard, but legal, hit and Mackenzie went to the ground. She got back up, shook herself off and kept playing. Everything seemed fine. A few hours after game she complained to her folks that her legs hurt and they took her to a hospital. The first hospital couldn’t find anything specific but suggested they visit a second hospital. The second hospital determined that something was wrong but not what exactly what it was and suggested a third hospital. With the pain increasing and paralysis setting in, Mackenzie and her parents headed to the third hospital, where they determined she had damaged her spine. By this time she was paralyzed from the waist down. They recommended she go to St. Joe’s, which has one of the best physical therapy departments in the state. And that’s where she is today and will be until at least mid-January. Mackenzie’s long term prognosis for a full recovery is excellent. But in the short term she has to learn how to walk again. And her soccer playing days are over, at least for the next year and a half. A lot of people in these circumstances, youngsters or oldsters, would set the table and throw a pity party for themselves. What impressed me most about Mackenzie is that not only is there no pity party, she’s approaching this as a grand adventure. 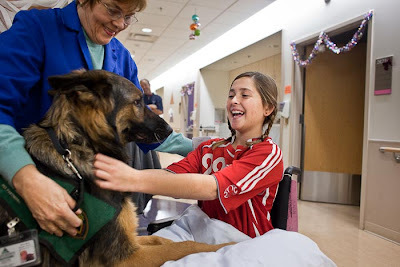 The photos; Top Mackenzie and her physical therapist, 2nd: Mackenzie stretches during therapy, 3rd: Mackenzie greets a therapy dog in the halls of the hospital, 4th: Mackenzie's father helps her back to bed from her wheelchair after therapy.